I found one resource work especially helpful, both when I was photographing these Atlanta images and when I was making the web pages: AIA Guide to the Architecture of Atlanta. Text by Isabelle Gournay. Photographs by Paul G. Beswick. Athens, Ga: University of Georgia Press, 1993. It is a bit out-of date, but still extremely valuable. 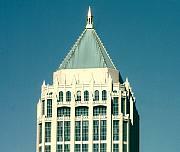 All of the Atlanta photographs were taken in late February, 2002.